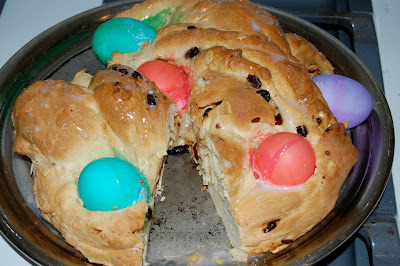 Unlike some of the recipes that have been in my family for generations (or centuries, in the case of one that will remain a family secret), this recipe for Swiss Easter Bread is fairly new. From a magazine, says my mom, who introduced it to our family, and was absolutely thrilled that I decided to carry it on myself this year. I suspect that, since I'm getting married in June, I'm probably evincing some "nesting" instinct to recreate the food of my childhood for my new family. Whatever -- Easter Bread is delicious. Combine 2 cups of the flour with the sugar, yeast and salt, and stir. Combine 1/3 cup milk, water and butter, and heat to 130 degrees (this is harder to do than I thought; I ended up overheating it, but I just let it cool on the counter until it reached the right temp). Add the milk mixture to the flour mixture, and add the room temperature eggs. Mix for three minutes, and gradually add 1 cup flour. Turn the dough out on a floured board, and knead until it is smooth and elastic, about 8-10 minutes. The dough will absorb about half a cup of flour from the board. Place the dough in a large, oiled bowl, and turn it so the oiled side is up. Cover, and place in a warm spot (this was missing from the recipe, and not being very experienced at baking, it didn't occur to me until later; I ended up setting the bowl atop an oven set at 200 degrees for an additional hour to help the yeast rise, but if you put it in a warm place from the get-go, the timing is probably close to right). Let the dough rise until it is doubled in size, about 30-35 minutes. Divide the dough into thirds, and roll each into a 20-inch long rope (this is also harder than it sounds -- you really have to pull carefully as you roll, or you'll break it or it won't stretch). Loosely braid the ropes, and shape them into a circle. Use some milk on your fingertips if you can't get the ends to stick together (I didn't do this, and my braid fell apart a bit, so the finished picture isn't as pretty as I would have hoped). Place on a greased cookie sheet. Carefully tuck the colored eggs deeply into the folds of the braid. Cover with waxed paper and a towel, and let it rise again until doubled in size, about 40 minutes. Bake at 350 degrees for 35 minutes, until the bread is browned and sounds hollow when tapped with the back of a spoon. Mix the remaining milk, vanilla extract and powdered sugar until smooth, and drizzle over the top of the bread. This recipe took quite a bit longer than I'd expected it would, in part because of the first attempt at rising the dough being unsuccessful due to my failure to put it in a warm spot. I started a bit before 10 a.m., and the bread wasn't out of the oven until after 2 p.m., but I think now that I have the idea down, it'll go faster next time. And be prettier. But as the fiance said, it sure is delicious. This would make a great brunch dish, or a spring potluck showstopper. There is nothing finer than home baked bread. 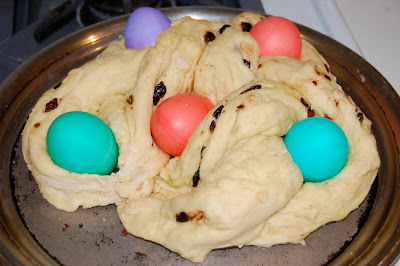 This is a very nice recipe and I love how it wraps the colored eggs. Would like to try this next Easter. Stopping by from the lady bloggers tea party! I'm always looking for an awesome new cooking blog to read and yours is great! I love the bread with the eggs! What a nice Easter tradition. I will remember to try this next year.